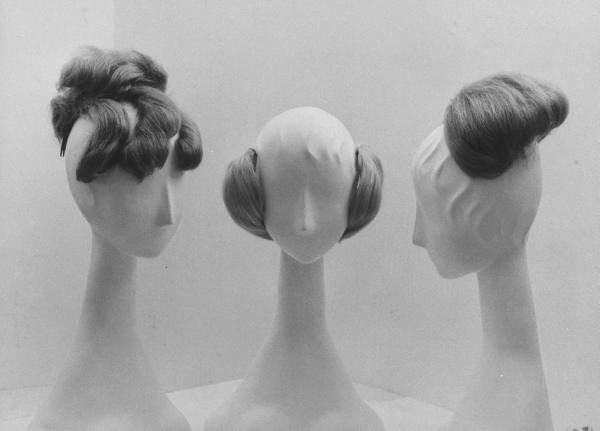 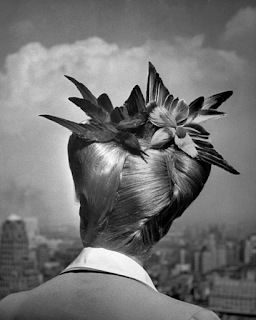 A woman showing her fashionable wartime hairstyle called Winged Victory. 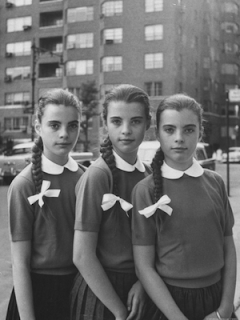 NYC. 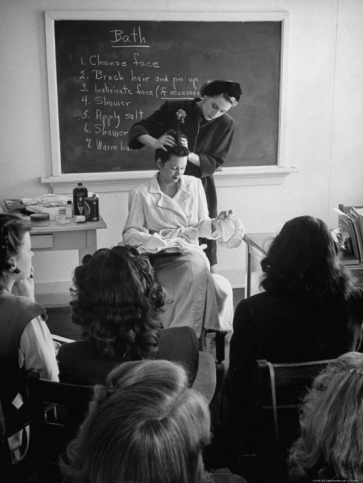 All photos are courtesy of LIFE magazine archives and are captioned and dated accordingly. 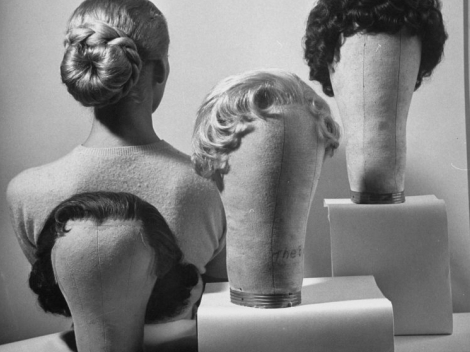 This wonderful shot of a woman's hairstyle decorated with birds is from the August 23, 1943 issue of LIFE magazine and was part of a story about "amateur vs. professional ways of achieving a summer coiffure." 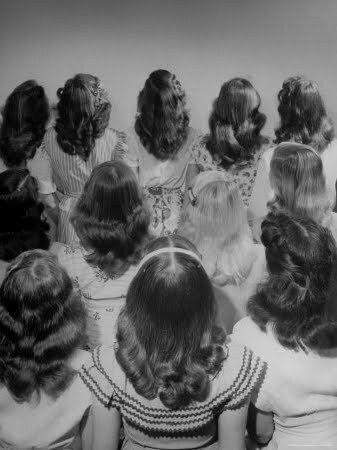 It was taken by photographer Nina Leen, who shot thousands of photographs over the course of her career for LIFE magazine. She captured (I'd say lovingly) American woman in their day-to-day lives from the 1940s until 1972, when the magazine ceased publishing weekly. Her photoessays of housewives, young working girls, and socialites reveal the idealized femininity of the time and show both the public and private lives of women. I present a few of Ms. Leen's photos here that speak to women and their hair. 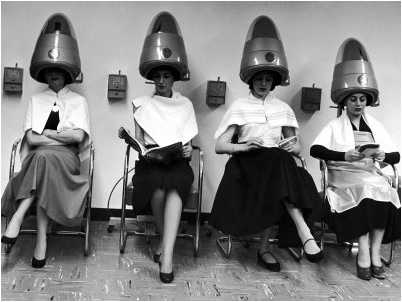 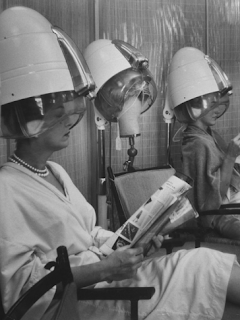 Women Sitting and Reading under Hairdryers at Rockefeller Center "Pamper Club." Model Vikki Dougan attaching hair clips to wig. 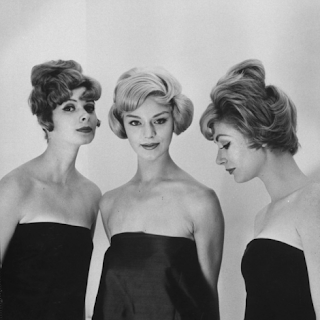 Model Vikki Dougan Wearing Attachable Bun of Extra Hair, Next to Other Wigs. 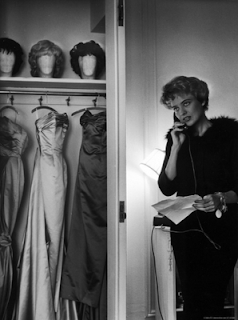 Singer Julie Wilson on phone beside closet with hanging evening dresses and wigs on top shelf. 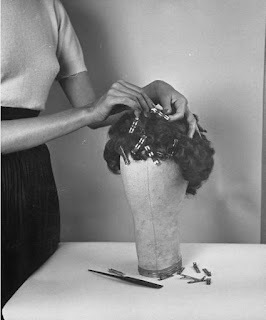 Picture of an Woman with a "Butch Haircut." Triplets Christina Dees and Megan Dees Modeling Their Braids Before Getting Hair Cuts. 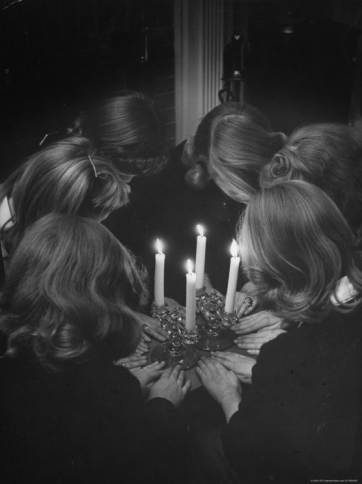 secret initiation ritual by candlelight for photographer because only a real member has ever seen the real thing.